Queensland is a very large state. Many offshore cruises and hirings are based on the northern coast and the Great Barrier Reef. However, this is outside the scope of this information. The Great Dividing Range which follows the east coast divides the waterways into two geographical regions. The waterways west of the range all form part of the Murray/Darling River system. 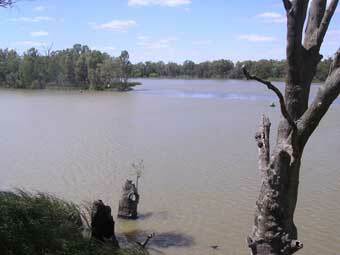 The Murray River is described in a separate section. The coastal waterways are located between the Range and the Pacific Ocean. They include rivers, coastal lakes and sheltered inlets and bays. The coastal rivers are all similar and are only suitable for boating in the generally short sections where they cross the coastal plains. The rivers north of Sydney are generally more popular because of the warmer climate. On the coast, up to 300 km north of Sydney, there are many coastal lakes which are very popular for all types of boating activities. The sheltered bays and inlets are popular for fishing, sailing and short pleasure cruises but such activities seldom involve boats which provide overnight accommodation. There are numerous centres along the coast which provide boats for hire and other facilities. The type of boats available are almost exclusively either motor cruisers or house boats with a range of accommodation available from 2 to 10 persons. As well as the cruising activities, there are many places of historical interest and numerous National Parks close to the waterways. All the major towns near to the waterways provide other tourist activities and plenty of facilities for all types of outdoor sports. Visit NSW is the official NSW tourism website. Victoria is situated at the south of the Australian continent. Despite its small geographic size, it is highly developed and populated. The tourist facilities are excellent and the standard of the roads is high. Melbourne, which is the capital city of Victoria is also the second largest city in Australia. It is situated on Port Phillip which is a haven for yachting enthusiasts. Nearby is the smaller bay called Western Port. The Murray River provides a natural border between Victoria and the neighbouring state of New South Wales. A separate page discusses boating on the Murray River. Lake Eildon is a large water storage which offers a number of boating holidays. It is situated on the Goulburn River which flows into the Murray. However, this Lake is over 100 km from the Murray, and there is no navigation in between. The most extensive lakes and river system in Australia is in the Gippsland area in the east of the state. Within Gippsland there are two major areas for boating: the Gippsland Lakes between the towns of Bairnsdale and Lakes Entrance, and Mallacoota Inlet at the extreme east. The state tourism authority is: Visit Victoria. These towns lie on the Mitchell River in the centre of the Gippsland Lakes which covers 400 sq kms of sheltered waterways and offers excellent marine facilities. Every type of boating is catered for. The lakes extend into the heart of Paynesville in a network of canals known as Riviera Harbours. A ferry takes passengers to Raymond Island. Lakes Entrance is the holiday town in the centre of lakes tourist area. As it is situated on the coast, all types of boating are available and it is easy to hire a wide range of boats from deep sea fishing boats, to holiday craft with sails, inboards or outboards. Visitors can also cruise the inland waterways on the ferry services. There is very little opportunity for boating holidays in South Australia except in the Riverland area, on the Murray River in the state’s south east. Information on boating facilities in this area is included in a separate section. There are a number of fishing ports on the coast but, apart from limited boating within the harbours, there are no facilities for inland boating. 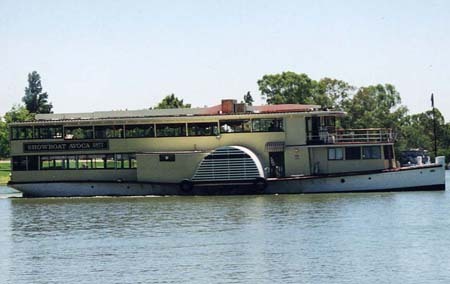 The remainder of waterways within South Australia are not suitable for any practical boating and no facilities for tourist cruising are available. Research South Australian holidays at South Australian Tourism Commission. The Murray River is about 2750 kms in length. Despite its size, the capacity of the river system is relatively small by world standards. It rises near Mt Kosciuszko and flows generally westerly forming the border between New South Wales (NSW) and Victoria. Tributaries of the Darling River rise in south western Queensland and on the western slopes of the Great Dividing Range in New South Wales. The two rivers join at Wentworth in far Western New South Wales, from where the Murray continues into South Australia before discharging into the sea at Goolwa on the shores of Lake Alexandrina. The Murray/Darling basin involves four Australian states and in the 19th century was of great importance to the transportation system of a large part of the country. In the 1870s and 1880s hundreds of paddle steamers and their associated barges plied the two main rivers and parts of many of the tributaries and were the major form of transport of primary products to the markets and goods and supplies for settlers. Echuca, in Northern Victoria, was the largest inland port in the Southern Hemisphere with wharves stretching continuously for over 1 1/2 km along the river bank. Although no longer used for commercial transport, the river system is still important to primary production in Australia by providing water for irrigation. The river system however still provides facilities for pleasure boating and supports a flourishing tourist industry. 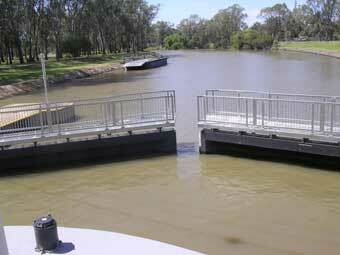 The Murray River is provided with locks and is navigable from the Hume Dam near Albury in south east New South Wales to Lake Alexandrina in South Australia. Paddle steamers providing overnight accommodation, operate from many centres along the river, and houseboats are available for hire. Just south of Lake Alexandrina is the Coorong National Park. The Coorong is a narrow stretch of water separated from the sea by large sandhills. Although an interesting area for fishing and observation of water birds, it is not available for boating cruises. The principal river towns are very interesting historically and offer a wide range of tourist and sporting facilities. Wine is produced at many locations and numerous vineyards welcome river tourists. The river flows past, or close to, several national parks. Only short sections of the tributaries are navigable because of weirs, dams and other obstructions. The New South Wales, Victorian and South Australian government tourist authorities all provide more detailed tourist information and all the principal towns support Tourist Information Centres from which more detailed information can be obtained. The state covers a vast area but has a very small population which is centred on Perth in the south west. Two useful websites relating to West Autralian tourism are Western Australia and Visit WA. In the interior of the state there are very few permanent watercourses. There are however several gorges which include very spectacular scenery with short stretches of permanent water. Normal access to these remote areas is by coach operated by city based tourist companies. Tours to some of these locations include boat excursions but these are limited to short day cruises and boats providing overnight accommodation are not available. In the South West of the state houseboats can be hired for travelling on estuaries and rivers at the following locations where other tourist facilities are also available. Tasmania is the small island state south of the Australian mainland whose climate and small size provide a great contrast to the rest of Australia. Its terrain ranges from seashore, to farmlands, rainforests, alpine lakes, numerous mountains and wilderness areas. More than 20% has been listed with UNESCO as a World Heritage area. Tasmania has a temperate climate with four distinct seasons - spring, summer, autumn and winter. However because of its geographical position south of the Australian continent, regional differences are marked. The western coastal areas are wet and the climate can be severe. Further east, it has a temperate maritime climate where extreme conditions are rare. The three major areas for boating holidays are D'Entrecasteaux Channel, Macquarie Harbour, and Port Davey to Bathurst Harbour. D’Entrecasteaux Channel region: D'Entrecasteaux Channel is a continuous 140 kms long waterway, south of the state capital, Hobart. It is studded with islands and bays and is excellent for cruising. Diverse scenery includes rolling farmlands, apple orchards, mountain lakes and rainforest. In addition, a number of cruises are available from Hobart. Macquarie Harbour and the Gordon River: This harbour is an open waterway 285 square kms in area, which is fed by several large rivers including the Gordon and is surrounded by dense rainforest. Port Davey - Bathurst Harbour: This remote area is in the heart of the South West World Heritage Area. The terrain is rugged, but the waterway is sheltered with many tiny islands. The offical website for Tourism Tasmania is Discover Tasmania.